A group, Kimpact Development Initiative (KDI) has raised the alarm of imminent violence in Oyo, Ogun and Lagos States during this Saturday's general elections with a call on security agencies to beam their watch light on the States. But the group argued that Osun state would experience peace before, during and after the elections. The Executive Director of KDI, Mr. Bukola Idowu made this known in a press statement issued after a press conference on Wednesday and made available to journalists in Osogbo. Idowu who doubles as the coordinator of South West Hub of the Nigeria Election Violence Report (NEVER) project towards THE 2019 general elections said during a press conference said the KDI conducted a preelection survey/hot spot mapping that revealed that Oyo, Ogun and Lagos would be violent during the polls. 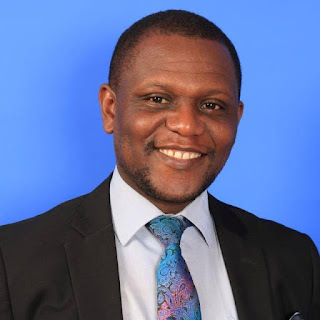 "We want to inform the general public on the key findings the kimpact pre-election survey/hot spot mapping done before the 2019 General Elections and also inform citizen observation/monitoring could help on mitigating Electoral violence,share medium to report Electoral violence in there communities, and to remind all Electoral stakeholders to play the rules at this critical stage of the electoral process most especially before, during and after 2019 General Elections. 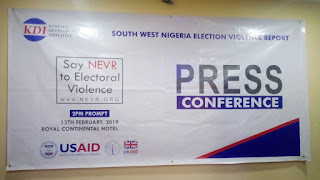 "The Nigeria Election violence Report (NEVER) project is supported by international the international foundation for Electoral system (IFES). "The project focus on developing the capacity of civil society, they talk about, methodology and Key findings on kimpact pre Election survey/hots spot, kimpact carried out there survey throughout the Local Government in South West Nigeria, and they said Osun will be the most peaceful state during,before and after Election. "But Osun must not relax their guard. Lagos, Ogun and Oyo may likely be the most violent State during the election process, and we call on INEC , Security agents and Politician's to order, because they may likely pay role in electoral violence and they talk about political thugs and call on INEC, Politician's, youth leaders, political gladiators and all stakeholders to please ensure peaceful atmosphere before, during and after Election," the group stated. It also called on the media to desist from reporting fake news during and after the elections. In attendance are press, civil society, people living with disabilities and other electoral stakeholders.